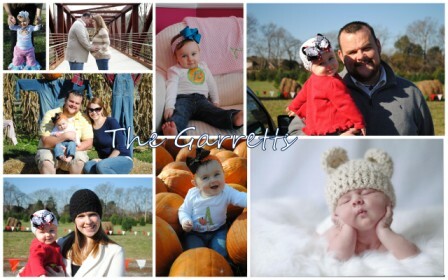 The Garretts: Throw that Spoon Away! 16 days. That’s all I’ve got until my baby officially crosses over from the “months old” group to “years old” group. I try to be reflective in most areas of my life, particularly in relationships & decisions. 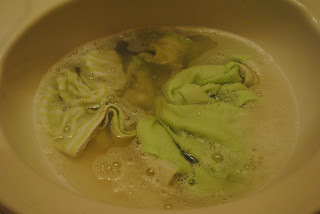 This, of course, has spilled over into my motherhood. In light of that, I think my next few posts will be on things that we’ve tried, enjoyed, and learned in this past year as first time parents, just some fun stuff and I’m sure some more serious stuff as well. I think most people know I’m an advocate for breastfeeding. I certainly understand that not all women can breastfeed, choose to, etc. However, I also believe that most women are rarely offered the support and knowledge they need to be successful in achieving their breastfeeding goals, whatever those goals may be- whether 2 weeks, 2 months, or 2 years. Unfortunately, I’ve seen that this lack of support leaves most women feeling like they are failures or that their bodies have failed them, which isn’t truth. Instead of being surrounded by other women, care providers, and family that assist, encourage, or are very knowledgeable about breastfeeding, most women are told to simply stop trying-- which completely undermines that woman’s goals and mindset for her achievements. It reinforces the idea that “No, you can’t. You just aren’t able to” and suggests that they or their bodies are incapable. Because I’ve seen that happen more often than not, I am extremely grateful (and I do mean grateful) that I’ve been able to nurse Abi Kate for so long. She has nursed like a barracuda from the time that she was only a few minutes old. While we certainly had a relatively easy experience, those early days were definitely challenging. (You know the magazine pictures with moms all sweet and refreshed looking and pleasantly nursing their baby with a smile and a pretty shirt snuggled up in a soft rocking chair? Ok, that does not happen the first 4 weeks. Just let that image go, embrace a different one, and know that it will be that easy in a few weeks!) I was so blessed to be surrounded by a husband that encouraged me, women (including my mother) who offered their wisdom and experience and supported my goals with their words and actions. I was blessed to have a fantastic lactation consultant who reassured me and offered praise instead of discouragement and has served as an endless source of knowledge. Therefore, when we began to look into introducing solid food, it was extremely important to me to preserve the nursing relationship. I actually always planned to make my own baby food. My mom did, so I planned to do what she did. It is much cheaper and also much healthier than the store bought version. When Abi Kate was a month or two old, I really started inhaling information on breastfeeding and I came across the idea of Baby-Led Weaning. An easy description: skip the purees, go straight to table food, and let baby feed himself. The more reading I did on it, the more I agreed. But I was really disappointed because I had wanted to make my own food. I even had all my baby food recipe books ready to go. I had all these visions of me being Super Mom with my freezer filled with little ice cubes of homemade sweet potatoes and organic baby applesauce. (And honestly, most of those visions that included me being Super Mom in any way, form, or fashion have now completely disappeared! Welcome to motherhood, Katie!) Since I was agreeing with what I was reading, I told Tommy what I was thinking. As always, he was completely supportive of any new, random venture and was happy to learn about it himself and jump on board with me. (He is truly one of a kind.) The process of learning to eat solids just made sense to us with this method. I subscribe to the theory that “Food is for fun until they are one.” I actually remember my IBCLC telling me that when she was packing up to leave after a home visit when Abi Kate was 8 days old. It stuck with me, encouraged me to research, and shaped the way I felt about introducing food. I always nurse first, then offer solid foods. You’d think this would slow down my child’s appetite. Not so much. She can and does throw down. We waited until Abi Kate was 6 months old to begin solids, mostly because I just don’t believe in introducing food before that (and yes, I do think there are exceptions to my “rule”). Since we were going to be offering foods other than easily digestible breastmilk, we wanted to pick very nutrient dense foods. Tommy knows a lot about nutrition, vitamins, and how they work inside the body. 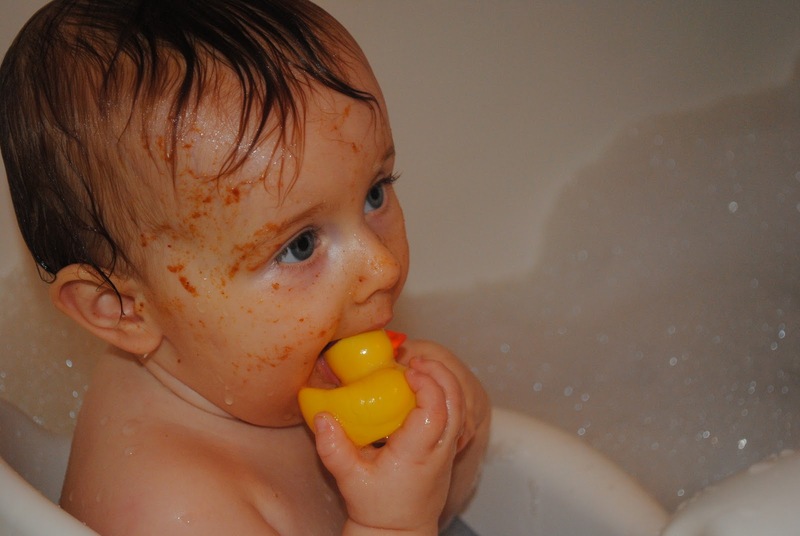 I had learned a lot about the process of Baby-Led Weaning (BLW) and its many benefits, so we complemented each other very well here. We picked avocado to begin with, giving her large chunks that were too big for her to choke on. Avocado is rich in healthy fats, and as infants should NOT be on a low calorie diet, we felt it was appropriate to begin with. It’s a common first food suggested in BLW. She loved it, and it is one of her favorites to this day. She can eat an entire avocado within a few minutes without blinking an eye. 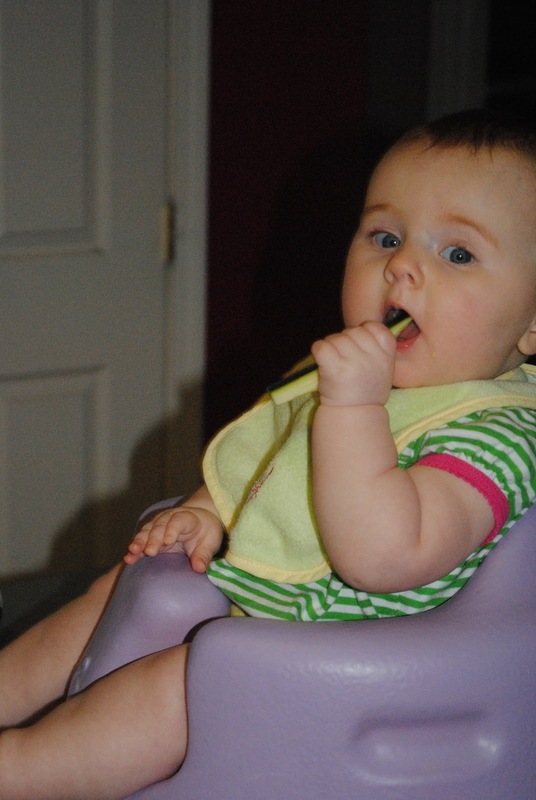 One of the benefits of BLW is that babies learn to chew food before swallowing it. This was a big deal-clincher for me because it made a lot of sense. I have rarely seen a baby chew rice cereal or baby food, and I have fed a lot of babies. Hence the reasoning behind graduated thickness in pureed food. As soon as something solid went into Abi Kate’s mouth, she immediately began gumming it, thus learning to chew before swallowing. 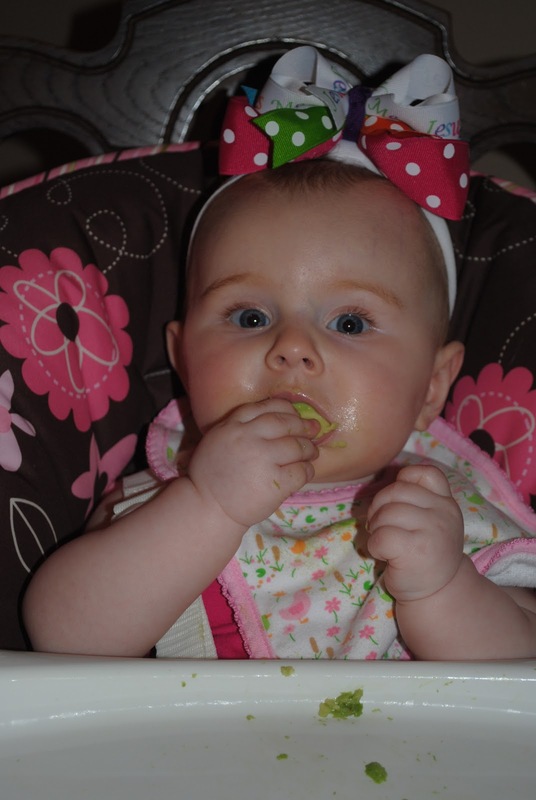 And no, she did not have any teeth when she began solids. Since babies’ gag reflexes are located more towards the front of the mouth than the back, yes, they do gag occasionally when they eat food. However, one of the benefits I saw from that was that Abi Kate quickly learned how to clear food out of her throat. If she gagged, we made exaggerated chewing faces to get her back on track with chewing, so to speak. It worked. It definitely made my heart stop the first few times, but I reminded myself that she wasn’t choking. Choking is no sound, color change, no air passing through, etc. Gagging isn’t a big deal. I accidentally gag myself all the time when I brush my teeth. I feel like she is at much less risk for choking in the coming years as she learns to eat more foods because she knows how to clear a big piece of food out of her throat, she knows to spit it back up and try again, etc. She would not have learned this with me spoon feeding. And for the last few months, it has rarely happened. Honestly, it didn’t happen all that much in the beginning either, but it is an important part of understanding of BLW works. One of my favorite parts of BLW is that it uses your specific baby’s cues to accommodate their hunger and allows them to become interested in food gradually. In my opinion, both of these things are extremely important in cultivating healthy eating habits, food regulation, and adopting a wider food palate. 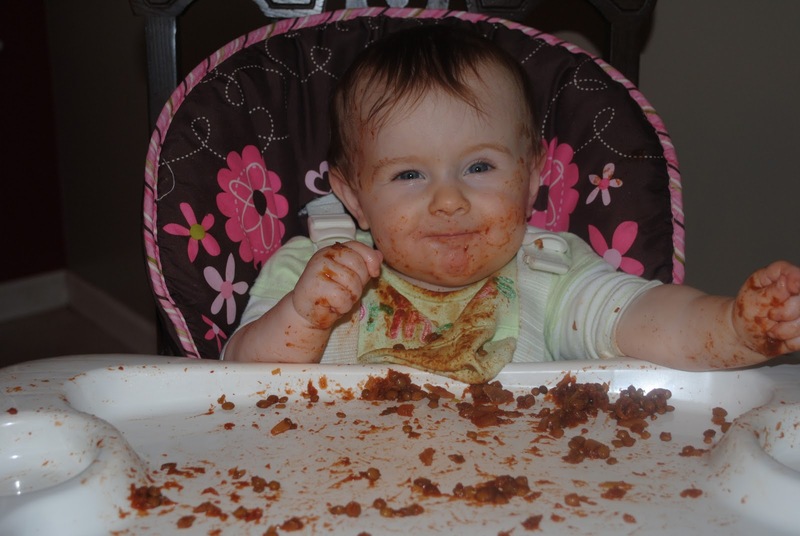 Babies’ hunger is much like ours--sometimes they’re hungrier than others. Some mornings, I wake up famished and want a huge breakfast. Sometimes, a piece of fruit is plenty for me. Because Abi Kate feeds herself, she regulates food based on her hunger level, not how much is “left in the jar” or how much she “should be eating” based on a measurement chart (this is another benefit of believing “Food for fun until she’s 1.”) I don’t expect her to consume a certain amount and I don’t spend anytime measuring the amount she eats, which allows her to eat until she is full. She never overeats and she doesn’t undereat. Babies do not have food associations the way we do, and they’re not attached emotionally to food like we are either- whether we avoid or consume more of a particular type when we feel happy, sad, etc. She eats the amount her body needs and can handle at that moment. I never worry about her not eating enough because the majority of her calories and nutrition come from breastmilk. The other food is just added nutrients. As she grows and is ready to make solid food a greater part of her regular diet, she spaces out her nursing sessions because she eats more food in one sitting. It’s a slow, but healthy and gentle practice to weaning in my opinion. Another great benefit is that she eats a great variety of foods. You can only find particular types of foods in premade baby food, and even if you make your own, it’s hard to create the right texture and consistency of some foods. She loves kiwi, mango, cantaloupe, sautéed baby spinach leaves, peppers with garlic and onion, all types of dry beans, scrambled eggs with Tuscany seasonings, cinnamon carrots etc. Because she’s breastfed, every meal already tastes different to her based on what I have eaten that day. She prefers a lot of the seasonings that I do-- garlic, onion, black pepper, herbs, etc. 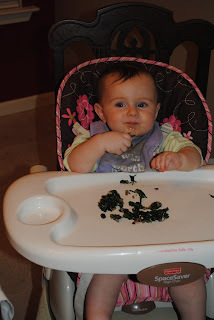 In fact, when I realized that I could season foods in preparation for her at such a young age, it almost made me feel like I was making her “baby food.” (Which restored my Super Mom visions….. totally kidding!) Those baby food books come in handy with seasoning ideas for real foods. And if you’re creative in the kitchen already, you can really get into this method! 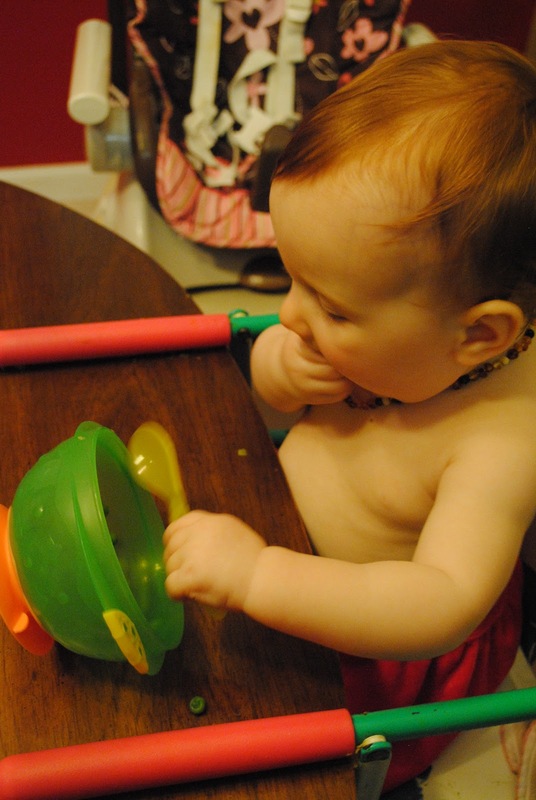 Baby Led Weaning allows her to explore a variety of foods and flavors in their original fresh form, without changing the texture or with added water (which makes things taste more bland). So far, we’ve found almost nothing that she won’t eat. That’s one of the points of BLW-- that babies will simply eat whatever you eat. Tommy and I are pickier than that for her at this point, though. It has definitely made me stop and consider what I am eating and why I am not willing for her to eat that as well. In the last several months, we’ve attempted to move to a more plant-based diet. (Just an FYI- we’re in no way vegan or vegetarian. I like my cheeseburgers! But we’ve tried to make meat much less standard in our home.) BLW has been an extra encourager in that for us. I know lots of people think we are silly or just typical “first-timers” for being very selective over what she eats. Lots of people have told me that I won’t be that way once a second baby comes. I’m sure there’s truth in that, but I really hope not. I hope I can always put nutrition before convenience in regards to my children. To me, these are formative years for them holistically, and that includes the development of their organ systems. I want to offer quality foods with quality nutrients while I can control what she eats. One day she will be four and will have a definite opinion on what she wants to eat and probably where she wants to eat. She will have the rest of her life to struggle with saying “no” to processed foods much the way that I struggle. She will one day have to choose between cherries or chips and water or coke the exact same way that I do. Why wouldn’t I want to give her the best start I can right now? Why wouldn’t I want to help boost her immune system while I can? Why wouldn’t I want to teach her to eat real foods not processed foods? I hope it will make her choices easier when she is older. There’s a few more benefits I’ve seen. One, I don’t have to feed her. She has always fed herself. No splitting time between feeding her and then myself. We all just sit down and eat together. In fact, if I try to feed her a piece of food, 99% of the time she spits it out of her mouth, then picks it back up and puts it in her mouth on her own (Tasty, huh?). As she has grown, we’ve done different things with food. Sometimes we offered great big chunks, other times very little pieces that she couldn’t choke on. This has helped develop her pincer grasp. Sometimes we offer sticks of food so she gets used to grasping and taking appropriate sized bites. 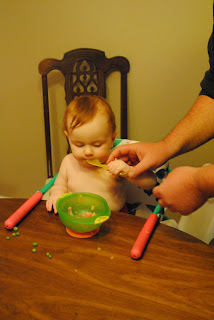 Because she is used to picking up food and putting it directly in her mouth, it helps with her direction and control as she learns to use utensils for food. Another benefit is that she’s never experienced constipation. I really think that’s because she’s controlling the amount she needs. Her body signals for her when to stop eating, and because I’m not expecting her to consume a set amount, her little tummy never gets overfull. She also eats a mostly plant- based diet, which also prevents constipation. A third benefit is that if you are particular about purchasing organics, you can do it more easily with BLW! Yes, I know they sell organic baby food, but have you seen the cost of it for one small jar?! You get so much more food from one piece of organic fruit than from one jar of food. So, toss that baby spoon off to the side! You might find you don’t miss it at all. And your baby might not either! 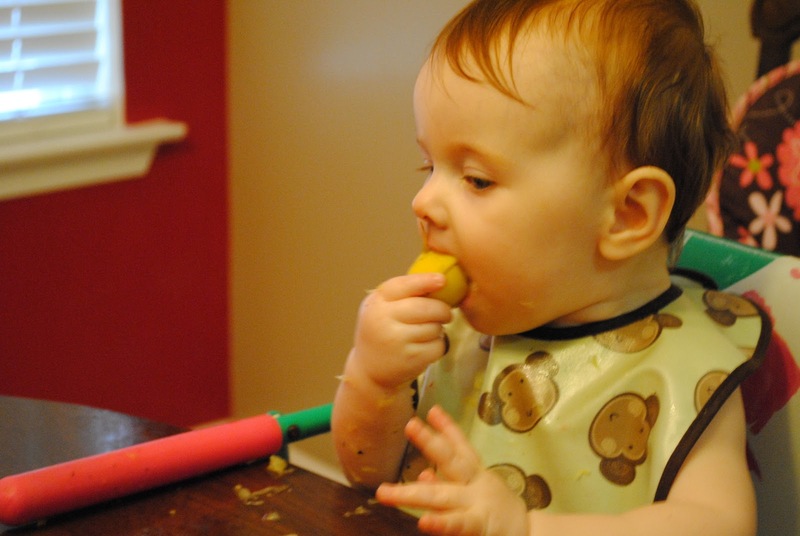 Here’s what Baby Led Weaning looks like at a variety of stages….. Some messes are just easier to clean up in the tub! But look at that clean, happy baby! 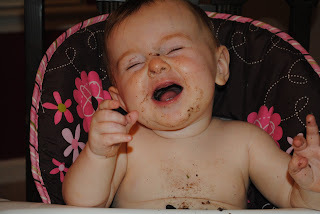 Apparently, Carribean black beans are a good reason to laugh! 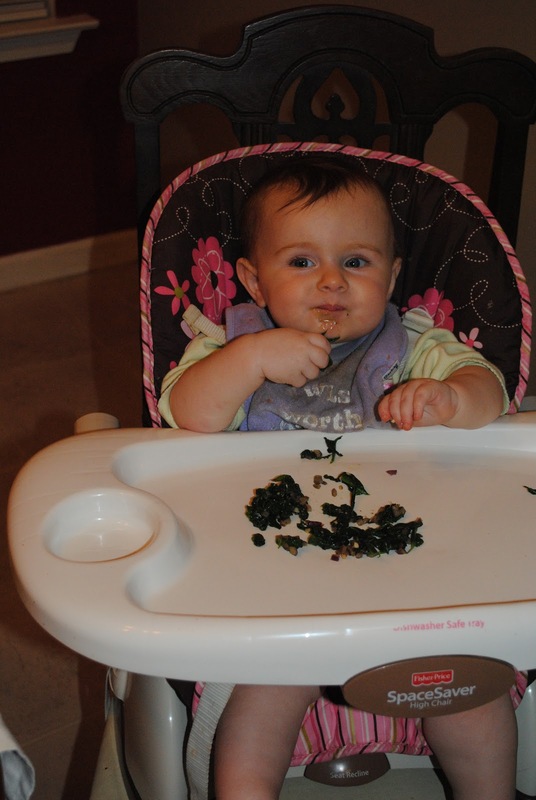 Spinach for lunch at 9 months! Eating a banana & oranges for breakfast at 10 months. Daddy helping hold the spoon steady with cantaloupe and strawberries. The picture after this was too fuzzy and definitely an example of "I can do it myself!"